HOW TO USE: See also Warning section. Read the Patient Information Leaflet if available from your pharmacist before you start taking carvedilol and each time you get a refill. If you have any questions, ask your doctor or pharmacist. Take this medication by mouth with food as directed by your doctor, usually twice daily. The dosage is based on your medical condition and response to treatment. To reduce your risk of side effects, your doctor may direct you to start this medication at a low dose and gradually increase your dose. Follow your doctor's instructions carefully. Take this medication regularly to get the most benefit from it. To help you remember, take it at the same times each day. For the treatment of high blood pressure, it may take 1 to 2 weeks before you get the full benefit of this drug. It is important to continue taking this medication even if you feel well. Most people with high blood pressure do not feel sick. Tell your doctor if your condition does not improve or if it worsens (for example, your blood pressure readings remain high or increase, or you have worsening symptoms of heart failure like increased shortness of breath). SIDE EFFECTS: See also Warning and Precautions sections. Dizziness, lightheadedness, drowsiness, diarrhea, or tiredness may occur. If any of these effects persist or worsen, tell your doctor or pharmacist promptly. To reduce the risk of dizziness and lightheadedness, get up slowly when rising from a sitting or lying position. The risk of dizziness is highest within 1 hour after you take your dose. Taking this medication with food and starting treatment with a low dose and slowly increasing your dose as directed by your doctor help to reduce the risk of dizziness. This drug may reduce blood flow to your hands and feet, causing them to feel cold. Smoking may worsen this effect. Dress warmly and avoid tobacco use. Remember that your doctor has prescribed this medication because he or she has judged that the benefit to you is greater than the risk of side effects. Many people using this medication do not have serious side effects. Tell your doctor right away if you have any serious side effects, including: very slow heartbeat, severe dizziness, fainting, unusual weakness, change in the amount of urine, numbness/tingling of the hands/feet, blue fingers/toes, easy bruising/bleeding, mental/mood changes (such as confusion, depression), seizures. 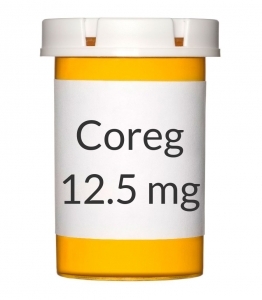 Although this medication may be used to treat heart failure, some people may rarely develop new or worsening symptoms of heart failure, especially at the start of carvedilol treatment. Tell your doctor right away if you develop any of these serious side effects: swelling of the hands/ankles/feet, severe tiredness, shortness of breath, unexplained/sudden weight gain. A very serious allergic reaction to this drug is rare. However, get medical help right away if you notice any symptoms of a serious allergic reaction, including: rash, itching/swelling (especially of the face/tongue/throat), severe dizziness, trouble breathing. This is not a complete list of possible side effects. If you notice other effects not listed above, contact your doctor or pharmacist. In the US - Call your doctor for medical advice about side effects. You may report side effects to FDA at 1-800-FDA-1088. In Canada - Call your doctor for medical advice about side effects. You may report side effects to Health Canada at 1-866-234-2345.